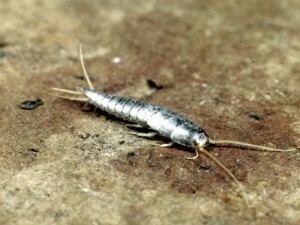 Silverfish are placed in the order Thysanura which is considered one of the most primitive of the living insect orders. There are three species considered common: the common silverfish Lepisma saccharina, the grey or longtailed silverfish Ctenolepisma longicaudata, and the fourlined silverfish Ctenolepisma lineata. Silverfish are particularly common in bathrooms and kitchens due to their preference of warm humid environments. They are adverse to light and like to eat starchy items such as wallpaper and wallpaper paste as well as books. They can also eat some fabrics.